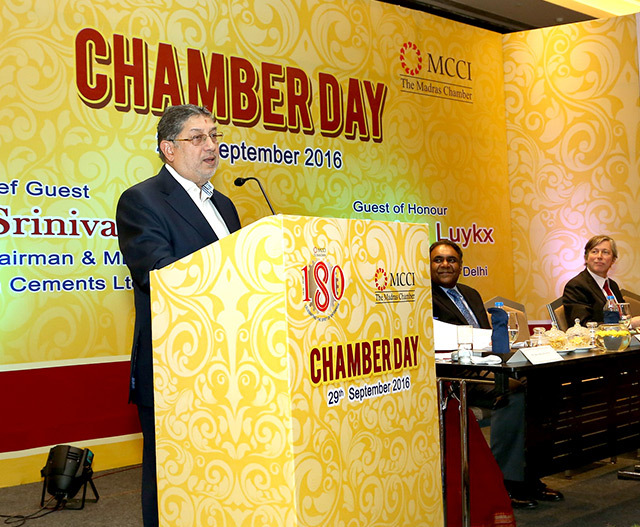 At the recently Chamber Day function of the Madras Chamber of Commerce and Industry, N Srinivasan, the ViceChairman and Managing Director, The India Cements Ltd presided over as the chief guest. Chennai: In his thought provoking address to the attendees, N Srinivasan said, “In the last two decades of reforms and liberalisation, everything had changed in India. The Indian Industry had grown like never before and created huge capacity. But the Indian manufacturing sector is left facing many challenges and cost burden and it requires a level playing field to be cost competitive. Articulating his views on the growth of Indian economy post liberalisation (since 1991), he said Indian corporates had free access to capital, technology and India was flooded with imports and foreign investment. “The IT industry grew in tandem and supported imports. Along with FII, FDI and foreign investments in various shapes and forms had helped the country to build forex of $350 billion,” he explained. He goes on to say that this along with a huge consuming domestic economy without much dependent on the external markets helped the country to stand firm despite many external crisis, collapse of economies and currencies. After years of buoyancy, the Indian economy had languished during the last stages of UPA regime and it has not picked up as expected in the current NDA regime. Referring to the Make in India policy, Srinivasan said, “We are already making in India. Indian manufacturing sector is competitive – we can be competitive. It is easy to say you must be cost-competitive, but do we have a level playing field on the taxes front?” he questioned. Today, the Indian industry is facing a huge burden of indirect taxes, high cost of money and interest cost (12 per cent), free imports without any duty, lower import duty on raw materials than finished product etc. There are fresh challenges. The licensing committee has gone, but the environment committee has come. If one wants to set up a project, it takes two or three years. They have to get environmental clearances; they have to reckon with huge cost of land. While a proper price is to be paid for a land, the problem is the challenge posed by a “combination of activism” in the form organisations, judiciary, local populace and political parties. Srinivasan said this has to be addressed by powers that be and the chambers of commerce should raise this. Otherwise, it will retard fresh investments into the country.